The Apple Watch has some great built-in fitness and workout apps, but there are some even better options on the App Store. Here are some of the best Apple Watch fitness apps for achieving your fitness and exercise needs. It's hassle-free and very easy to use. Social features so you can compete with friends. No free customizable training plans. You need to pay for all the app's features. Strava is one of the simplest exercise apps out there. Primarily a running app, it tracks stats like distance, pace, speed, elevation gained, your average heart rate, and calories burned. As well as running, it also tracks many other activities like swimming, gym workouts, rock climbing, surfing, and yoga. Upgrade to Strava Premium for $59.99 per year and gain customizable training and workout plans, along with live feedback, so you can achieve your goals safely and faster. Strava is a great one-stop solution for all your workout needs, with advanced analysis over the standard Apple Watch Workouts app. Extensive advanced features for the keen runner. Connects to MyFitnessPal and many other health and fitness apps. Easy to create routes to follow. Needs a subscription to unlock some of the best features. Sometimes complicated to sync other devices with it. MapMyRun is a useful companion for the avid runner. 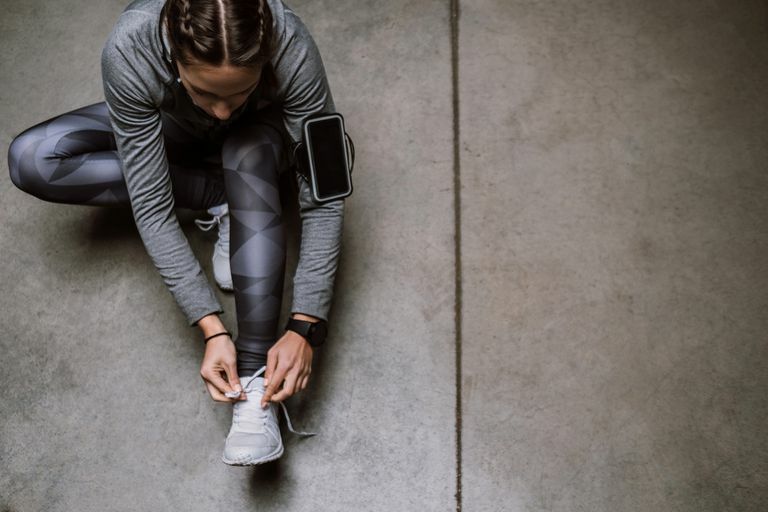 Besides tracking the usual stats like distance, duration, pace, and heart rate, it also offers detailed breakdowns such as split times and how many miles your running shoes may have left in them. Upgrade to the MVP Premium package for $5.99 per month or $29.99 per year, and you gain heart rate zone analysis to determine when you're working your hardest, as well as specialist training plans for achieving your goals. Live Tracking is a useful safety feature too, allowing friends to see exactly where you are on your run. For the dedicated runner, MapMyRun is a feature rich option. It also tracks over 600 other activities for added convenience. Gentle but effective program that teaches you how to run. Works on a treadmill as well as outside. Different motivational coaches to listen to. Only offers basic statistics on your Apple Watch. Not much use after 9 weeks. Few people can go from no running to comfortably running a 5k race. Couch to 5K is the best fitness app out there for teaching you how to go from a walk to an actual jog and run. Across 9 weeks, users are taught how to increase their distance and pace slowly but surely so they can complete a full 5k run. The app costs $2.99 and includes 4 different motivational virtual coaches, basic stats including distance and pace, along with graphs that highlight your progress. If you've never run before, this is the ideal way to start out before moving onto more independent running apps. Easy to track reps and sets easily. Can look back to see how much progress you've made. Supports hundreds of different exercises. You need to know the names of your exercises beforehand. Designed for experienced gym users. Gymaholic is one of the easiest ways to track your workouts and sets on your Apple Watch. It's possible to track over 360 different exercises from squats to HIIT workouts, bodyweight training, and every other form of exercise you might perform at the gym. Simply enter all your workout details in the app, and Gymaholic reports back on the amount of weights you've lifted, the calories you've burned, and your average heart rate throughout. The basic app is free with a premium version that offers all features for $31.99 per year. Easy to create your own workout routine. Fits into any daily routine. Quite basic descriptions on the Apple Watch. Limited tuition on how to avoid injury. Streaks Workout is the perfect Apple Watch fitness app for working out at home, without the need for lots of free time or expensive gym memberships. The app includes 30 equipment-free exercises with 4 different workout lengths including 6, 12, 18, and 30 minutes in duration. Users can choose exactly which exercises they want to complete, devising their own personalized workout plan. It's simply done on the Apple Watch with more extensive statistics available via your iPhone. The app costs $3.99 with no additional in-app purchases required. Good variety of exercises for experienced users. Fun rewards that unlock over time. Entertaining twist on familiar format. Some of the humor doesn't always work. More exercises cost $1.99 to unlock. Carrot Fit keeps things lighthearted, yet challenging for experienced gym goers. It offers a "7 minutes in hell" routine, in which users get 30 seconds for each of the app's 12 exercises with a 10 second rest break between each set. Aimed at those who already exercise, it taunts users through sarcastic messages and a sly sense of humor. Underneath the cynical surface, it's a great way to get into interval training for a reasonable $3.99. Its various methods of tracking your progress are a great form of encouragement in the long term. You can see exactly how many calories you have 'spare' for the day. Simple interface that's easy to use. Syncs with many other apps. The Apple Watch version is quite simplistic. You need a premium subscription to get the most from it. MyFitnessPal isn't just about how many steps you take each day, but about the food you consume as you go about your day. While the bulk of useful information is only available on the iPhone app, the Apple Watch version quickly shows you how many calories you have left to burn today, how many steps you've walked, and what nutrients you need to eat more or less of that day. The app also logs all the exercises you've performed, as well as syncs with other apps and devices, so it's a good way of creating a well-rounded fitness and workout routine for your body and lifestyle. The app is free to download with a premium subscription unlocking all features for $49.99 per year. Detailed stats on everything imaginable. Confusing interface if you don't know what you're doing. Doesn't teach you how to complete any of the exercises. If you know exactly what you're doing at the gym and just want detailed statistics on your routine, then Workouts++ is the ideal Apple Watch workouts app. The app allows you to customize your Watch display to show only the data relevant to you. Conditional colors and complex graphs are an option, along with a plethora of numbers breaking everything down. The app isn't for newbies to the gym and it won't teach you how to do anything, but it's perfect for evaluating your performance over a long period of time. The app is free to download and use. A form of personal trainer on your Apple Watch. Mixture of beginner exercises and tougher workouts available. Focuses on completing exercises safely. Watch app is a little basic. Free to download and try, yet in need of a $89.99 annual subscription to get the most from it, Keelo is a substantial strength HIIT workout plan for users keen to get stronger faster. It offers daily full body workouts that combine strength, conditioning training, and cardio exercises so no part of your body is deprived. Each program is personalized based on your workout history, so it's like having a personal trainer on your Apple Watch. The app also tracks reps completed and timings, so you know exactly what to do next and when. Keelo isn't cheap, but as a replacement for a personal trainer, it's hard to fault. Easy to create your own routines. Lots of ways to track your body's improvements. Not the prettiest of apps. You need to pay $5 to get everything. GymBook is aimed at those who know roughly what they're doing at the gym, but could do with a helping hand. Its Apple Watch app provides easy ways to enter the exercises you've completed along with details on sets, reps, and how much you've lifted. The accompanying iPhone app fills in the details by showing users how to complete the workout safely. It's easy enough to devise your own workout, so it's ideal for those who know what they're doing and want a simple way to track their performance. A one-off payment of $4.99 unlocks the full wealth of statistics, as well as being able to track body measurements and changes.